Ooh, you’re in for a treat! We are not quite there yet with Fall here in NYC/NJ. The AC in the room where I am now writing this post is blasting 60 degrees – yes, my husband and I are adepts of a Siberian lifestyle -, so we are still in Summer mode. However, I’ve decided to fully embrace Fall and this blog is officially going to be full of things pumpkin, apple and comfort food in general! 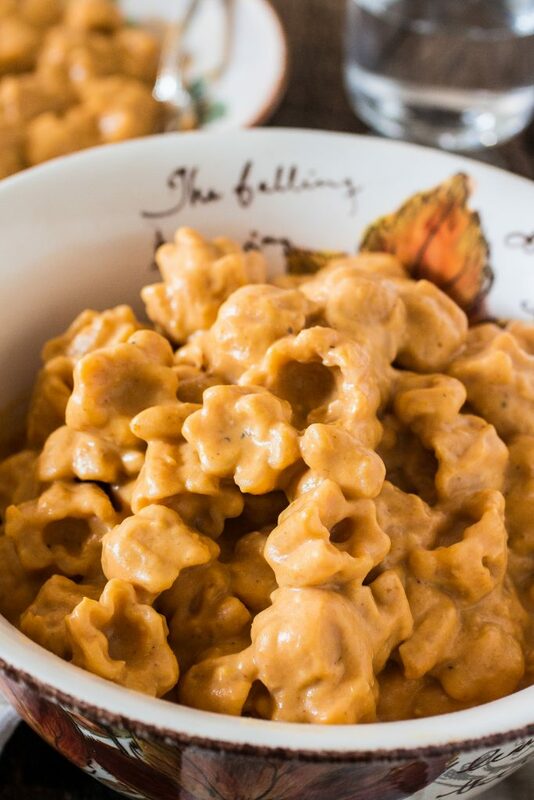 Starting with this delicious, creamy, out-of-this-world Pumpkin Mac and Cheese! *Dramatic pause for approving sighs and applause* ??? If you like pumpkin, you will absolutely adore this dish. It is beyond pumpkiny and you will wanna lick your plate clean. ? We don’t eat Mac and Cheese in Brazil. ??? I mean, you can probably find it somewhere, but it’s just not something we grow up eating like most Americans do. I am crazy for cheese and anything cheesy, though, so it was just a matter of time until I fell in love with this American staple. But it didn’t happen overnight… Oh, no! Seriously, how can people eat that thing? ? Needless to say I didn’t touch macaroni and cheese for a long time after that. Until it was served to me as an appetizer at a New York restaurant called Friend of a Farmer. Guys, that thing changed my life! It was garlicky, cheesy (5 types of cheese if I recall correctly), creamy and everything you would want a mac and cheese to be! That will be forever my mac and cheese memory – ya know, like you have the one that your grandma used to make for you? Instead it was made by a restaurant chef and probably costed over $10 just for an appetizer portion! And as it usually happens with dishes I try at restaurants and love, I went home and tried to recreate it. Since then, mac and cheese makes the menu fairly often at our home. I also love playing with different flavors. The other day I was browsing Home Goods for some food props – (no, I do not have enough food props, Tim! Leave me aloooone!) – and I saw these cute butternut squash fioretti that I thought looked like little pumpkins. Seriously, how could I not get them? They are adorable! They are also big and have a great shape and texture for Mac and cheese. 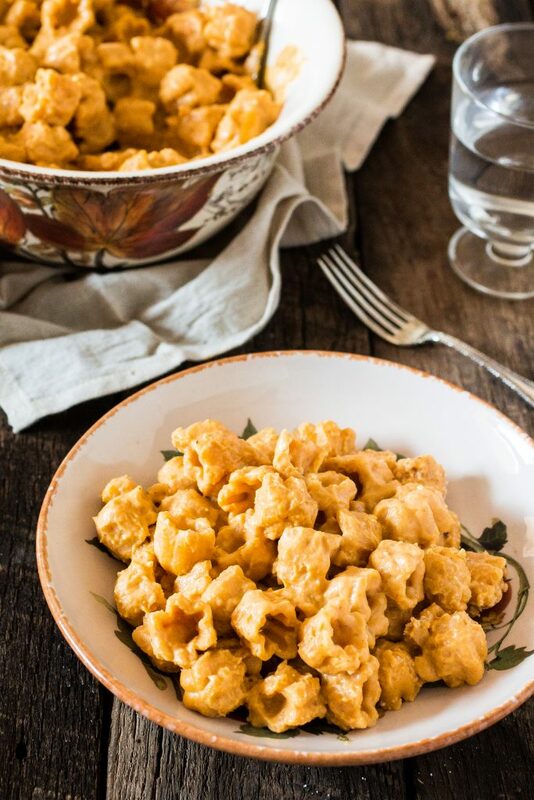 The creamy sauce gets into the macaroni and clings to the pasta perfectly, so every bite is a burst of flavor and sauciness. 1) it’s faster, quicker and requires less clean up! 2) it’s so much creamier, richer, smoother and “velvetier”. Oh, I would have ooey gooey stovetop Mac and cheese over dry baked mac and cheese ANY DAY, ANY TIME! How about you, do you prefer stovetop or baked macaroni and cheese? If you like baked, just follow the recipe to the end and then transfer your Mac & cheese to a baking dish, sprinkle with breadcrumbs and more cheese and voila! Bring a large pot of salted water to a boil, over high heat. Cook the macaroni according to package instructions. Drain and reserve. While the water boils, work on the sauce. In a saucepan, over medium heat, melt the butter. Once the butter is melted, whisk in the flour and cook for about a minute to get rid of the raw flour taste, being careful not to burn. Add the milk slowly, whisking constantly until the sauce thickens and there are no more lumps, about 3 minutes. Add the pumpkin and the cheese and stir until the cheese melts and you have a nice, rich and creamy orange sauce. Add the dry mustard, the nutmeg and season with salt and pepper to taste. Add 1/2 of the pumpkin cheese sauce to the pats and stir until it coats the pasta evenly. Then add the remaining sauce and stir to combine. PUMPKIN MAC AND CHEESE?!!! This is absolutely genius!!! Thanks, Anne! :) It was so delicious! ? Those pumpkin shaped pastas are TOO cute! 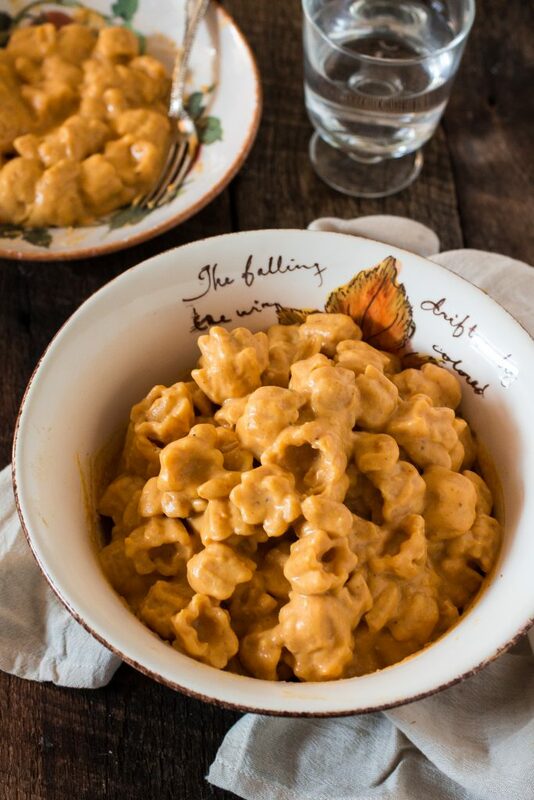 I’m such a huge fan of pumpkin mac and cheese and this recipe sounds delicious. It might just be my next solo dinner (husband doesn’t eat dairy so I always make mac and cheese when he’s gone!). It can’t come soon enough!! You could also make this dish with chicken broth instead of milk for your hubby. Wouldn’t be as creamy but still good.